Today I did what I often do when I'm working on a show - and by a show I mean a theatrical production - SHOPPING. I'm currently the costume shop manager at a local theatre, which I was surprised to find that I quite enjoy doing. Managing that is. Right now we are busy remounting a popular production from a couple of years ago, so I've been shopping to costume new cast members. Now, when it comes to shopping for other people I can do it all day. When it comes to shopping for myself though I'd rather have needles stuck under my fingernails. Since I spend so much time shopping for work though, I often keep an eye out for things I need. Case in point, an appropriate dress and shoes for several weddings that I am potentially attending this summer, the first of which is this Friday! Actually, I'm IN the wedding this Friday. My very best friend from Indiana is getting married and I get to be a part of it. This is a friend that I've known since fourth grade and is the only person from high school that I've kept in touch with over the years. I also was with her in the delivery room for the birth of her first daughter - you can be assured that this was the most effective birth control I've ever experienced in my life! This will be a quick trip - I'll be back home by Saturday night - but I'm so looking forward to it. 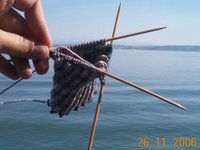 I am knitting a small token for her, but I plan to pick up the wedding gift while I'm there. In other knitting news, I've been effected by the Mason-Dixon knitting book in that I've been driven to make some simple knits. Using some squares that I knitted up a while back (I think they were meant for a blanket or rug of some sort) I made up this bag to felt. 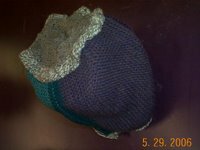 They are simple garter stitch squares made from various colors of Cascade wool yarn. Since they were individually completed I picked up the 40 sts on one end, knit a few rows in a different color, and then knit the band to the next square. Once I had the three squares connected I picked up the sts on what would become the bottom and knit a ruffle by increasing at increments of 10sts for a couple of rows. I can't remember what this yarn is, I bought it years ago in Evanston, IL. It is a heavier weight and definitely itchy, but perfect for a dense bottom. After binding off the ruffle I picked up the bottom sts again, eventually switching to dpn's and decreasing to 5sts before finishing. 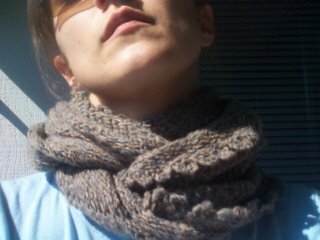 I picked up the stitches at the top also and knit a similar ruffle. Then I tossed it in the washer on hot water with a little detergent. I ran it a second time to get a dense felt and here's what I got! I've left it in the costume shop to dry overnight on this oversized hat block. I'm going to knit two strips of the solid dense grey wool to felt for handles. 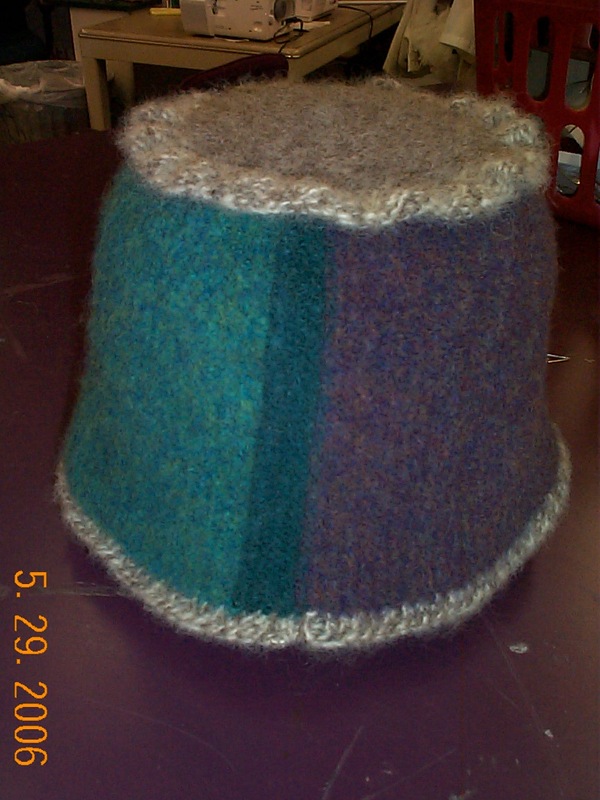 I love how the many colors in the heathered yarns came out in the felting process. It doesn't show up as well in the pictures. Once I get the hang of this blogging business I promise to start posting links. Meine Socke an der Bodensee ins Deutschland (My sock on Lake Constanz in Germany). I've been thinking and talking about starting a blog for a month now. I begin grad school this fall and hope this allows my friends and family to be a part of that experience. It will also be a forum for my favorite activity - knitting! Although I had stumbled on blogs while researching for a new production that debuted last fall at the theatre company I work for, I didn't consider starting one of my own until I stumbled upon the Yarn Harlot's blog. From that site I branched out and discovered the world of the online knitting community. Here were people that I could relate to! Now, my friends and family, and even That Guy (my man, the fiance, will hereafter be known as That Guy, or even TG for short) are very tolerant, and even somewhat supportive of my knitting, ahem, obsession. Yes, you can call it that. Just a couple of months ago at work we had a staff meeting in which we were given a sheet with statements on it. You were to read the statement and finish it with you own. It had stuff like "The toughest thing I've ever had to do was..." or "My favorite way to relax is..." Several of my finished statements had something about knitting or yarn in them. What I didn't realize when I was filling it out was that when finished we were going to exchange them and read them out loud! Let's just say my coworkers understood the full importance of my "hobby" from that day forth. 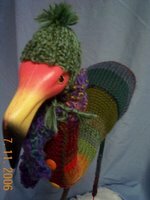 As for the friends and family, many of them have received a handknit item of some sort, so they are supportive if not somewhat amused. Mom has probably been the recipient of the most so far having had a pair of socks, two scarves, and mittens made for her (not just any mittens, each one has one of her cats faces knit on it, and they are not identical cats!) and the 2nd sister is probably close behind. That Guy has only received a pair of socks regardless of how many times I've asked him wouldn't he like a scarf or hat or something? He does want another pair of socks which are currently on the needles, and I think I've got him attracted to a zip pulli from the most recent Interweave Knits. It was 2nd sister who taught me how to knit. I have three siblings. Two older sisters (1st and 2nd sisters) and a younger brother (LB, or little brother). All amazing, talented, and smart people, as are my parents. 2nd sister taught me to knit at Thanksgiving about 3 and 1/2 years ago. By Christmas time I had made my first hat (That Guy and I lived in Evanston, IL at the time. Much colder then Texas!) and she gave me my first sock yarn. That's all it took to hook me. Much of it I've learned on my own. Some of it comes naturally as I'm a costume technician and sometimes designer at work. And some of it I've picked up from the tips that abound at numerous knit blogs. I hope that I'll be able to contribute to that forum.